If that title seemed both scary and confusing to you don’t worry, you’re in the majority. The bottom line is this. That little “S” stands for secure, and if your site doesn’t have it, Google is trying to make sure that visitors notice. If you’ve happened to enter the URLs from any old business cards into chrome lately, you may have noticed that upon routing you to the address you entered, the page included a lowercase “i” next to the address in the search bar when you arrived. Your browser is trying to notify you that the site is “insecure”. If you click the icon to investigate, you may see something that resembles the following. Google has just released Chrome 68 which prefers users to enter a URL beginning with HTTPS. As previously mentioned, the “s” stands for “secure” and basically declares that any data being transferred on this site is encrypted. That may sound a little cinematic, but really it just means that the information you enter when you visit a website is no longer completely visible for any wandering middleman to read and exploit. Browsing the internet works on a “request and response” cycle. The acronym HTTP stands for hypertext transfer protocol and it is more or less the foundation of data communication for the web. Any text, picture, or sound file is formatted into http before sending. When you send a request to a server, logging into Netflix for example, your computer creates a hypertext message that specifies whether it is looking for an HTTP or HTTPS site. The response from the server will include a message in the headline that states the HTTP format of the page along with a status code (The site itself, “file not found”, etc). The problem is that part of interacting with many sites involves entering personal information; social security numbers, credit card numbers, and more. If a site does not communicate through encrypted hypertext, any middle-man can jump in and view it like a cornerback picking off an interception. Google’s new chrome platform is no longer allowing users to take that risk without receiving a blatant notification. Google announced the upcoming change over six months ago, expecting responsible online business owners to act accordingly and get their site registered as secure. Why wouldn’t they? 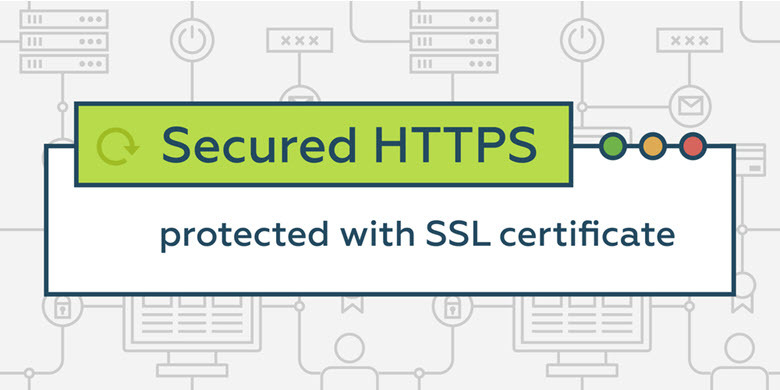 Though it began as a security measure for online banking, over 80% of the highest traffic sites on the internet now hold an SSL certificate. Nearly 70% of Android and windows traffic is now secure while Mac and Chrome OS hold roughly an 80% rate. Getting the picture? If your site has not transitioned to HTTPS, not only are you endangering the cybersecurity of your customers, you also look very much behind the ball. Depending on the sheer scale of the content, completely converting an entire website from HTTP to HTTPS can be time-consuming and intimidating. That being said, obtaining an SSL certificate by having a third party do the work for you is quite simple. A reliable SEO service should be able to assist you in this process. When it comes to online security, the river really only flows one way and is not likely to reverse its course. American’s are more vulnerable to data theft than ever before and they look to their trusted brands to be well informed and always looking out for their best interests. To protect your customer’s security as well as their image of you, move quickly to ensure that every page of your online space is using HTTPS URLs. Don’t show up late on this one. Matt is a freelance copywriter from Austin Texas with over ten years of experience in the education industry.